BUENOS AIRES, Oct 18 2012 (IPS) - A joint project by the energy and agriculture authorities in Argentina is seeking to boost electricity generation from forestry waste and other rural products which have enormous potential, according to experts. The Probiomasa programme, launched this year, is planning to increase energy supply from burning organic waste, from 3.5 percent of the current energy mix to 10 percent in 2015. “The goal is to raise biomass participation in electricity generation by means of a platform for private projects in need of promotion,” said Miguel Almada, head of the agroenergy area of the Ministry of Agriculture, Livestock and Fisheries. “Many projects are already under way, or are negotiating tariffs,” he told IPS. The idea is to save money that now goes to importing fossil fuels for thermal power stations, help improve living conditions in isolated rural areas, and reduce pollution. When biomass is processed for energy it emits less global warming-causing greenhouse gases than fossil fuels. In addition, efficient use of biomass contributes to the conservation of soil and water. Claudia Peirano of the Argentine Forestry Association told IPS that biomass is already a key element in this industry for producing energy, for its own use and for sale of surplus products. For example, the timber company Alto Paraná and the pulp and paper company Papel Misionero, both located in the northeastern province of Misiones, have their own electricity generation plants based on sawdust from their forestry plantations, she said. “The excess supplies the boilers of hotels (at the Iguazú Falls) for hot water and for heating swimming pools,” she said. It also contributes to the national electricity grid, she added. Peirano said that wood chips could be used to make cellulose or paper, with a higher added value than biomass, but the investments required would be greater and would take longer to yield returns. According to a study carried out with the support of the U.N. Food and Agriculture Organisation (FAO), Argentina has the potential to generate half the country’s total energy supply by burning biomass. The assessment by the FAO and government and technical bodies in Argentina mapped the biomass resources in each province to determine the available potential. The study’s methodology made it possible to identify, quantify and locate production and consumption of biomass throughout the country. The study, “Análisis del Balance de Energía Derivada de Biomasa en Argentina” (Analysis of the Energy Derived from Biomass in Argentina) concludes that biomass production today is “significantly higher” than official estimates and that the country has “an enormous potential of available biomass” over and above what is already used. The report’s authors indicate that biomass production could increase from the 7.9 million tonnes produced at present to 148 million tonnes. The province with the most resources is Misiones in the northeast, but they point out that there are others. The Green Economy, Boon or Menace? Based on different waste products, the northern provinces of Santiago del Estero, Tucumán, Salta, Chaco and Formosa would be good producers, as well as the central province of La Pampa, and Tierra del Fuego in the far south. Unlike biofuels, which are manufactured from specific energy-rich crops, biomass is made out of organic waste from other activities. The waste comes from the forestry industry, wine-making, rice mills, sugarcane plantations and sugar mills, yerba mate plantations, the cotton, oil, peanut and fruit industries, and others. 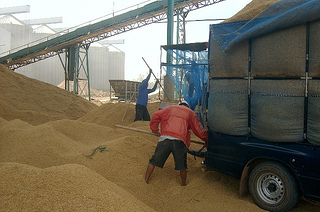 Despite its potential, the FAO considers that biomass has so far been the “Cinderella” of energy sources, without political visibility or recognition in development planning in many countries, including Argentina. FAO, which published its study in 2009 at the request of the Argentine government as a step towards the official launch of the Probiomasa programme, says the use of biomass resources is not just an environmentally-friendly option. As well as reducing the contribution to global warming, biomass energy promotes rural development, adds value to agricultural production, bolsters the growth of regional economies and creates quality jobs in the countryside. In an interview with IPS, Jorge Hilbert, an engineer and the coordinator of the National Bioenergy Programme at the National Institute of Agricultural Technology (INTA), said the government wishes to advance in this kind of development through the Probiomasa programme. “The FAO study (in which Hilbert collaborated) shows the productivity and quantity of waste generated by the agricultural and forestry industries at the national level, but now more precise work is being done for each province and the municipalities,” he said. In any case, the expert said, potential is one thing and economic feasibility another. “The resource is available, but if the price paid for the energy is lower than what it costs to produce, it is not viable,” he said. Tariffs are a key issue, as the other sources who spoke to IPS also pointed out. “If the prices aren’t right, there won’t be any business,” Hilbert said. However, he was confident this debate would be settled now that the programme depends not only on the Agriculture Ministry but also on the Ministry of Federal Planning, which includes the area of energy and sets tariffs.